Can Old Faithful compete with Netflix? BILLINGS, Mont. - Can Old Faithful compete with Netflix? The prospect of streaming wireless service deep inside Yellowstone National Park is re-igniting the debate over whether there should be any place off limits to technology. Park officials are in preliminary discussions with CenturyLink about installing a $34 million fiber-optic line through neighboring Grand Teton National Park and into Yellowstone. That would dramatically improve connectivity in certain areas for mobile devices. Details on the Yellowstone fiber optic project were obtained by Public Employees for Environmental Responsibility through a public records request and confirmed by The Associated Press. The Washington, D.C. advocacy group's executive director, Jeff Ruch, warned that bumping up the park's bandwidth will create more electronic distractions at the expense of the park's natural wonders. The CenturyLink proposal coincides with a National Park Service campaign to "Go Digital" ahead of its 100th anniversary in 2016. And it comes as concession companies have been pushing for more digital access in national parks, including Arizona's Grand Canyon, Texas' Big Bend and Maine's Acadia. It's a notion far removed from the park system's early days, when President Theodore Roosevelt took a break from a national speaking tour and dropped from the public eye for two weeks to go camping in Yellowstone. Yet as wireless connectivity spreads into almost every corner of modern life, the social pressures to "whittle away" at the remaining technology-free refuges are immense, said James Katz, a professor and director of emerging media studies at Boston University. Katz had a first-hand dose of those pressures this summer, when he travelled through Yellowstone with his teenage children. They hit all the main attractions: Old Faithful, Yellowstone Falls, roaming herds of wild bison. Whenever connectivity dropped off, Katz said, the complaints from the teens would begin. "It was quite fascinating to see a naturally-occurring experiment about what happens when you take away technology from kids," he said. "They wanted to be in touch with their friends and exchange Snapchat photos - not of the beautiful scenery but themselves." Another visitor, Vince Swagerty of Newberg, Oregon, wasn't surprised when he ran into trouble uploading pictures during a July tour of Yellowstone with his wife, son, 20, and daughter, 23. "You take a cell phone shot of one of the bison right next to you, almost looking in your window, and you want to get that up on Facebook," said Swagerty, a 51-year-old tech-savvy amateur photographer who works as an administrator at a Christian school. "You pretty much know you're not going to upload any normal-sized pictures from a cell phone, be we expected to face that." He added that it would be "neat" if Yellowstone had the same technological conveniences he finds outside the park, but wouldn't be bothered if he went back and still had connection problems ten years from now. No survey has been done to determine the quality and extent of wireless coverage in the 401 parks and other attractions overseen by the National Park Service, agency spokeswoman Alexandra Picavet said. She said the "Go Digital" campaign won't shape up the same way in every park, and each will have to decide what is suitable. But she said that the park service has no intention of looking backward as it enters a second century. "People are dependent on wireless, they're dependent on cellular - a mode of communication and activeness that is different from what the National Park Service has provided previously," Picavet said. 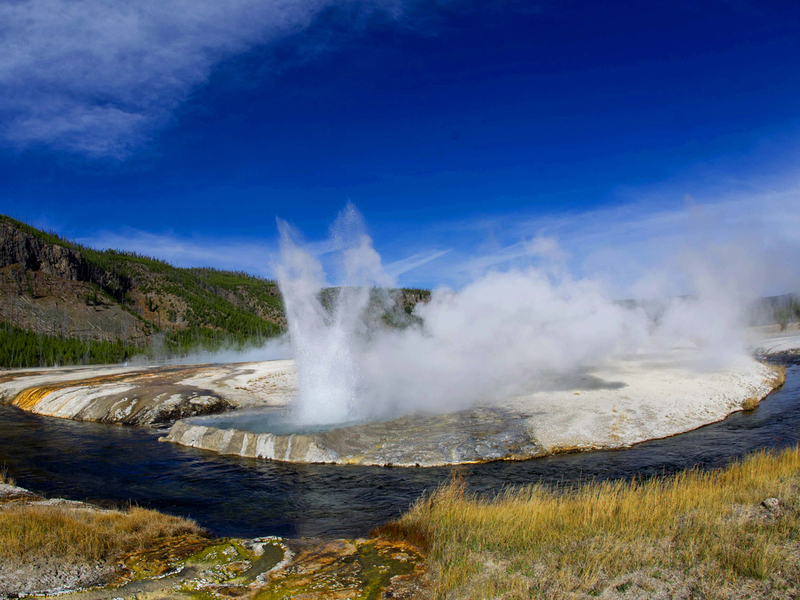 Louisiana-based CenturyLink has not submitted a formal application on the Yellowstone proposal, according to park officials and company spokeswoman Michelle Jackson. For the project to make economic sense in such a remote area, Jackson said, the company has asked for most costs to be covered by the Park Service and companies that would benefit from the line, including Verizon, Union Wireless and park concessionaires. Park officials said they have not agreed to provide any money. Yellowstone technology chief Bret De Young said the proposal offers a chance improve spotty and limited wireless services. He stressed that coverage still would be restricted to five developed areas inside the park. "They would want you to think we're going to do wall-to-wall coverage so people can watch Netflix," De Young said, referring to the proposal's critics. "It's just about taking the infrastructure we have and making it work." Ruch, the advocacy group director, said it would be inappropriate for the park to put any money toward a fiber-optic line given its backlog of road maintenance and other basic infrastructure improvements. He said the park should halt discussions with CenturyLink or invite public input into whether it's a good idea. Yet Ruch also acknowledged that his group is up against a suffusion of technology that shows no signs of abating. "I think if we were to put it to a vote, we're a Luddite minority," he said.